Oeam Village is part of the Tentative list of Republic of Korea in order to qualify for inclusion in the World Heritage List. Oeam village is a beautiful small village, whose inhabitants are largely in the 60+ range. The village is not really a tourist site, more being an actual old village which exhibits quite a few authentic structures. The unique aspect of Oeam is the artificial water system that goes through the entire village for gardens and agriculture. I enjoyed my visit, slightly disappointed at first, but after wandering the village for about an hour my enjoyment increased. There are no wow sights in the village, the atmosphere and setting is more what's on display. Very little tourist facilities. I doubt the site will be inscribed, many villagers have upgraded their quant homes, adding modern comfort improvements. 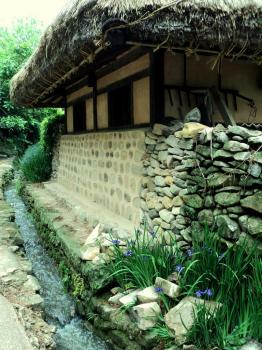 Furthermore, the site lacks some of the exquisite Joseon era buildings found in other villages such as Hahoe, Yangdong, or even perhaps Naganeupseong. There are some central buildings in the village, however many were closed for restoration during my visit. Nevertheless, the peaceful atmosphere and fantastic layout of the village itself is striking.